At the weekend we found ourselves in the Christmas gift area of a local garden centre. Nowadays these establishments all seem to supplement flagging seasonal sales by converting space to gifts, decorations, lights etc. Can’t blame them for that, and browsing them is an alternative to the often overpriced Christmas fairs that have similarly sprung up everywhere. 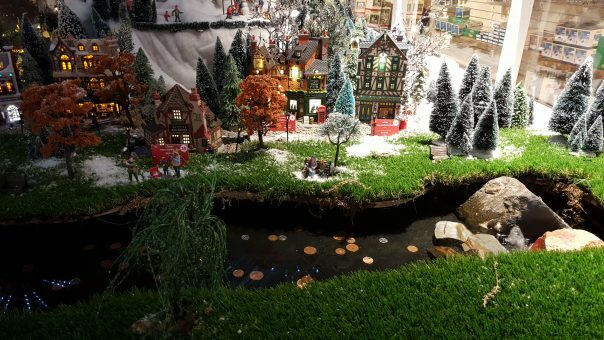 And among the more ubiquitous items to be seen are the sort of miniature houses with which you can establish your very own model village, or at least the sort of idealised version of it that keeps chocolate selections, shortbread boxes and makers of tins in business. So here they were – houses, church, post office, skating rink (because every village has its own skating rink…), and there was even a genuine stream for that final touch of verisimilitude (obviously not a genuine stream as it didn’t rise from the bedrock after falling on high ground, but the effort was there). And as can be seen from the picture this particular stream had gathered quite a collection of coins, seemingly tossed into the running water. Quite an incongruous sight in the middle of piles of fake wreaths and themed decorations. Even in this age of rampant materialism, there seems to be a deep-seated and unknowable (one might almost say unquenchable) desire in our hearts to propitiate water, to offer something of small value to whatever spirit dwells within and in return allow for the acknowledgement of some unspoken wish or desire. An urge that began in the remote past and continues, in debased and sentimentalised form, today. In this, the first in a short series of musings on the nature of our relationship with rivers and springs, I want to cast an eye on that urge, where it came from and why it survives in an artificial stream in a brightly lit gift shop. Why is there such a thing as a wishing well? Not so long ago (up to the beginning of the nineties), if you chanced to pick up a book on British folklore and looked up any of the folk practices still current – Jack in the Green, the Padstow ‘Obby ‘Oss, the Mari Llwd, any May celebration you care to name – you’d inevitably discover that these were all much diminished survivals of pagan practices, invariably concerned with either fertility or the turning of the year. Recently, however, a trend championed by Ronald Hutton has sought to examine this assumption with a more critical eye. Beginning with Stations of the Sun and continuing with the seminal Triumph of the Moon and subsequent titles, Professor Hutton examined these claims with the forensic eye of a historian, rapidly reaching the conclusion that none of these practices could be pursued further back than the middle ages, and in many cases no further than the seventeenth or eighteenth centuries. Whilst there has been something of a shift in recent years (ie, Pearson and Harrill, 2017) to a degree, this doesn’t matter. Hutton treats his subject matter with sympathy and an open mind and is never averse to the unearthing of new information, and in any case it is the experience, the psychology of the connection these practices help us make with the land and with our ancestors that is important, not the specific details of their pagan (or otherwise) survival. So can we say where the urge to make offerings to water comes from? Is this something bred in the Middle Ages, or is it later – the product, like so much else, of Victorian sentimentality? We can see the practice the length and breadth of the British Isles (and, of course, much further afield). Today, it mainly survives in the folklore of wishing wells, and it seems impossible to come across such a well, usually newly created and of self-consciously ‘quaint’ design, without finding at least a scattering of coins inside. And yet, we also know that the practice was widespread, commonplace and accepted back into Roman, Celtic and even earlier times. In a study conducted by Janet and Colin Bord it is estimated that each British county contains an average of 40 sacred wells (Bord & Bord, 1986) but it is notable that the great majority are situated in the old Celtic areas – Devon, Cornwall, Wales, Scotland – which may suggest that this practice was alien to those of Saxon and Germanic heritage. What we can safely say is that through the Iron and Bronze Ages, water was revered. This is understandable; every community depended on the presence of water for survival, not only for themselves but for the livestock and crops around which their lives revolved. Many settlements were situated by rivers or streams that ensured an abundant and ready supply of fresh water, others found springs and wells provided for their needs, but none could go without. And it was clear that such places were considered sacred, specifically those places where water arose from the land in seemingly mysterious abundance. These locales – sacred springs and wells – were seen as gifts from the gods, places of great sanctity, places of homage and, without question, places of offering. This can be observed not only from the abundance of finds in deposits that relate to springs and wells, but also from archaeological finds that may have been sacrifices to river gods or goddesses (ie, the Wandsworth Shield, Waterloo Helmet), either to obtain some favour or stop the river or watercourse claiming lives.